This place is great! Going to recommend it to all my friends who want to explore Fira. Panoramic views, private yet friendly neighbors. Breakfast to order. Very nice suite. The majority of the staff were wonderful and the view gorgeous. Breakfast in the morning was fantastic. Great location in the middle of all the action but in the hotel it is quiet. The location was perfect, and the view was irreplaceable! The breakfast was also too good, one of the best i ever had! We were in room 401. If you are looking for a room that is accessible for those with mobility issues then this room might work for you. It’s on the same level as reception and Main street. 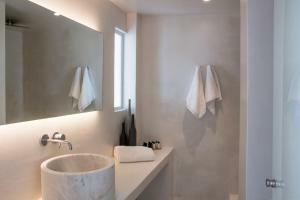 However the shower might be difficult as it’s over the large jacuzzi bath. We only stayed one night, but we were made very welcome. Great location and view. Friendly staff. Nice breakfast by the pool. Panorama Suites more than met my expectations! My room had a jacuzzi in the open space, a separate bathroom with large shower, plenty of floor space, a gorgeous view, and a quaint balcony. The hot breakfast was made each morning by one woman and it was more of a homemade style. The location was absolutely excellent--walking distance to shopping, restaurants, the bus terminal, and the cable cars. My room was 201 and was immediately off of the elevator/lift. Perfect location and a dream view from our balcony. Amazing!!! The view was perfect. Staff were great, really helpful. Superb location, comfortable&clean, with all you need. Excellent breakfast with variety of food cooked to your order in a place with an incredible view over the Caldera. Our room was accessible via elevator to the lower level and then 30 stairs down. The views of the Caldera are amazing. Breakfast by the pool overlooking this outlook everyday is a stunning way to start your day. Lying in bed in our suite below the pool, you also wake up to the beautiful Caldera. The Room is very clean and quite comfortable and we had a very private balcony area as part of the suite. Staff very pleasant and helpful. Lock in a great price for Panorama Studios & Suites – rated 9 by recent guests! 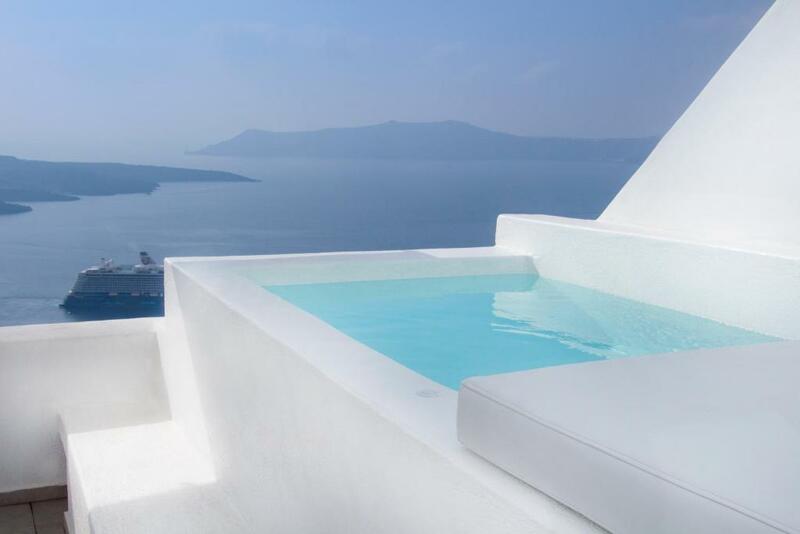 One of our top picks in Fira.Panorama enjoys a central location in Fira featuring a swimming pool and stunning volcano views. It offers traditional rooms with free Wi-Fi access and serves a rich a la carte breakfast. Panorama Studios & Suites are uniquely decorated following the Cycladic style. They come with a satellite TV, air conditioning and hairdryer. All units have a balcony offering panoramic caldera views. The swimming pool of the complex features a sun terrace set on the edge of the volcanic rock. The poolside bar serves refreshing drinks and light snacks. 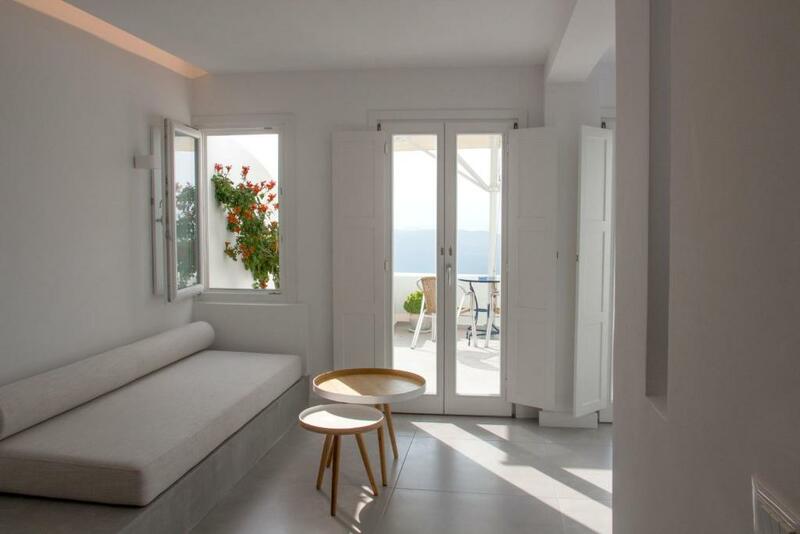 Panorama is within walking distance of the many bars, shops and restaurants of Fira. Santorini Airport is 3.7 mi away from the hotel. The charming village of Oia is within 6.2 mi. When would you like to stay at Panorama Studios & Suites? Standard studio by the pool, with shared balcony with views of sea and volcano, and the island's famous sunset. This open plan suite features Caldera views, a living and a dining area. 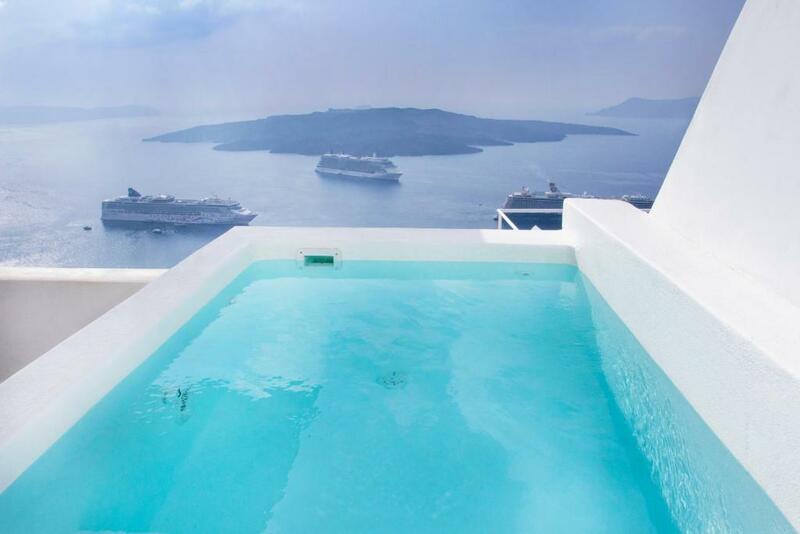 This suite includes a bathroom with spa bath and a Caldera-view veranda. Featuring a large furnished balcony with unobstructed Caldera views, this suite includes a spacious living room with dining area, a bathroom with spa bath, and a second bathroom with shower. Superior studio with large private balcony offering spectacular Caldera views. The room offers dining and seating area. 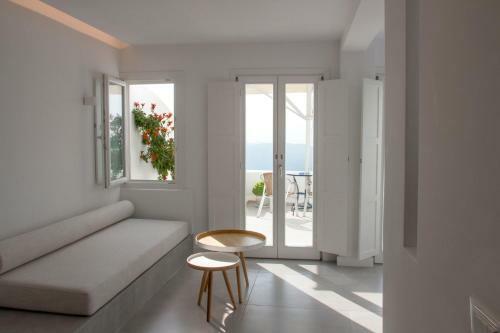 This villa features a balcony with Caldera views, a sofa and spa bath. House Rules Panorama Studios & Suites takes special requests – add in the next step! Panorama Studios &amp; Suites accepts these cards and reserves the right to temporarily hold an amount prior to arrival. Panorama Studios & Suites accepts these cards and reserves the right to temporarily hold an amount prior to arrival. Please note that some rooms are accessible via steep stairs. Please note that the swimming pool is open from the beginning of May until the end of October. Please inform Panorama Studios & Suites of your expected arrival time in advance. You can use the Special Requests box when booking, or contact the property directly using the contact details in your confirmation. Great location, magnificent view from balcony, breakfast served on roof top restaurant every morning with lots of choices. The hotel organised pick up from port and drop off to airport. The staff particularly Flavia were so helpful and friendly - organised tours for us . Loved all of it. We had to walk up many flights of stairs, so if you aren’t in shape that could be a problem. We enjoyed the exercise. Good location to find, fantastic view from our balcony and the breakfast is amazing that the staff gave us a menu to order what we like and next morning we just had our breakfast near pool; it's really wonderful. We had booked caldera rooms a year in advanced, and paid for two weeks before arrival. When we got there, one room was perfect, but the other was horrible. There was no caldera view. After much argument, they upgraded us for 5 out of the 6 nights. The 6th night, we went back to the original non-view room which turned out to be damp and moldy. The walls had cracked plaster that was falling off the walls. They had to have a separate fan going over and above the a/c due to the fact the room was so damp and moldy smelling. So beautiful, great balcony and spa, pool was nice, staff was wonderful. Breakfast was great. 6 levels down to get to our suite.. mostly stairs. We knew about this from the reviews, yet we chose to give it a try and was very tiring. Our poolside suite was too small, for us that was not a suite,so it did not meet our expectations. We tried to change the room, yet the hotel was unfortunately full booked at that time. Just some stairs to access the villa. Wanted to go to pool, but didn’t feel like climbing down and up the stairs. Location was perfect, view was amazing! Space for whole family, as we stayed in the villa. Breakfast was wonderful. The staff were all very helpful and provided us with plenty of options for things to do around the hotel and Santorini. Amazing suite, staff, facilities and views! Excellent location with shopping, restaurants etc..in close proximity and beautiful views all around!